Properties 3, 4 and 5 are self-similar, all making use of the space beneath each of the three coal hoppers, which feature as giant inverted pyramids suspended within the main, double height space. This 3 bedroom property is entered from the west side of the building, a short walk round the southern elevation and round the corner down a short flight of steps. The entrance hall faces directly onto the “snug” with wood burning stove and built-in seating, nestling underneath the mezzanine. Towards the south, at the end of the hall, is the largest bedroom, with dressing room and ensuite “Jack and Jill” bathroom. Bedroom glazing is at high level, according to the contours of the site, as can be seen in the section. Along this corridor is a dedicated utility room which also contains an exhaust air heat pump to provide energy-efficient heating for the whole property. 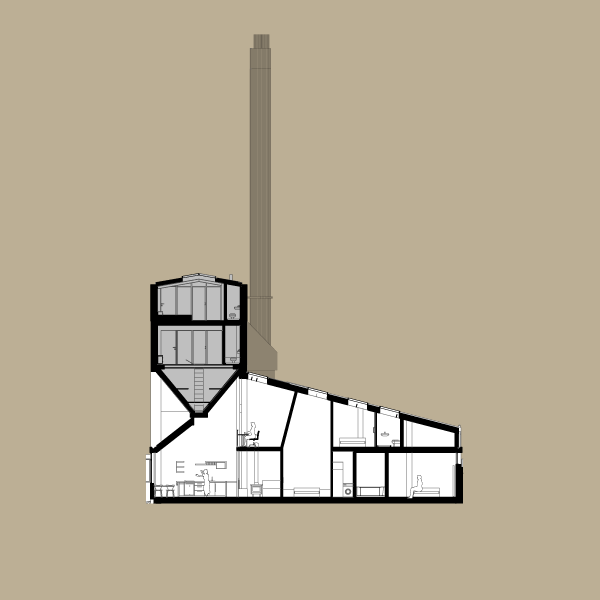 The main open plan kitchen and living room space is centred beneath the inverted pyramid form of one of the hoppers. An original window opening made in the north wall is unblocked and reinstated with double glazed units. The space gains south light, brought from high level as can be seen in the section. Leading on from the snug is a flexible space which could serve as dining room/ study/ third bedroom. 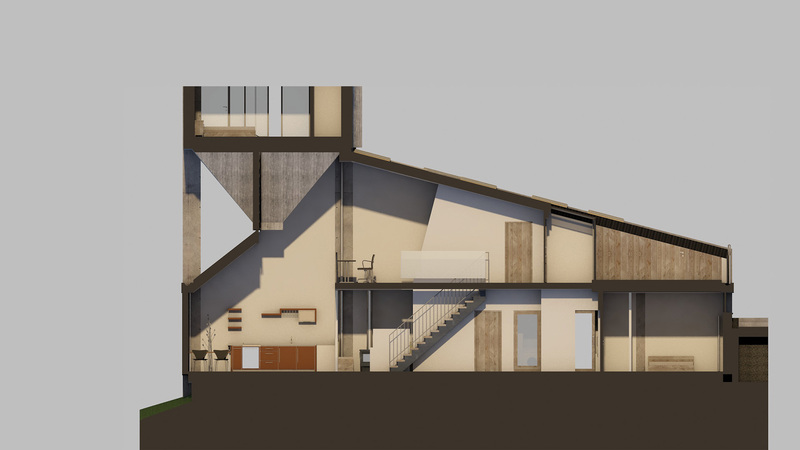 A dramatic, double height space, it is served by skylights on the south facing roof slope. Upstairs the mezzanine study area overlooks the main space. The upstairs bedroom has an ensuite WC and shower room; both bedroom and shower room are lit by means of skylights. 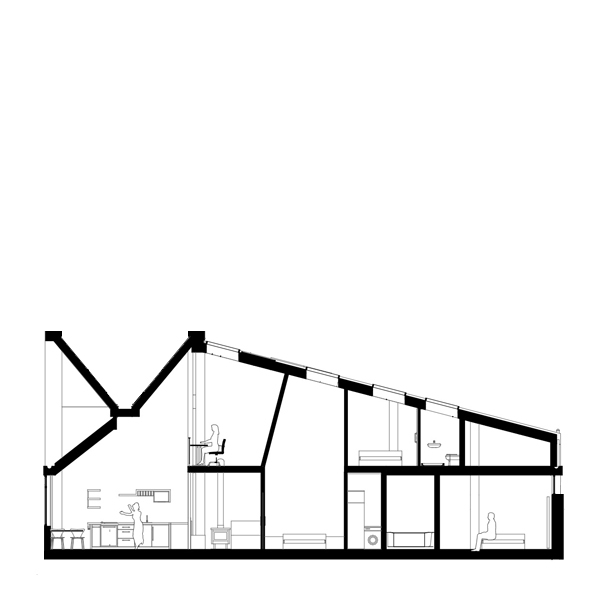 A store room at the south end of the floor makes use of an area under the sloped roof with restricted head height. The upper landing leads into the “winter garden” area, a highly glazed space which acts as a thermal buffer to the south facing terrace outside. Five solar panels are located on the roof.